TMD (Temporomandibular Disorder) is dysfunction in muscles that move the jaw and the temporomandibular joints. It can restrict movement of the jaw, cause jaw pain, grinding of the teeth, facial pain and tension headaches. It affects about 30% of the population. Discreet and comfortable, they are made specially for you. Cerezen™ is an innovative medical device made to target the source of your TMD symptoms. 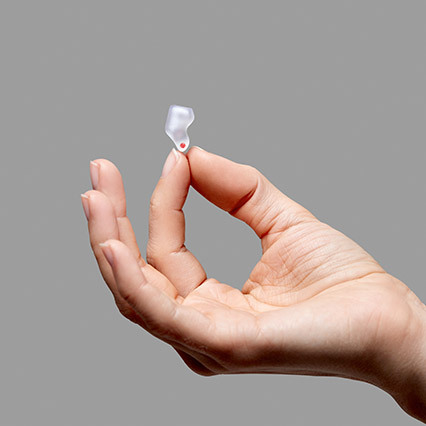 It consists of a pair of customised and discreet hollow inserts designed to snugly fit your ear canal. The shape of the ear canal changes when chewing, smiling, and speaking. The Cerezen™ encourages the wearer to favour the open bite position, minimising jaw clenching and retraining the jaw to remain in a relaxed position, therefore eliminating discomfort. Once TMD is diagnosed by your dentist, a professional audiologist takes an imprint of your ears. The appliance is then customised and created using 3D printing technology. This device is proven to be clinically effective, comfortable while worn, unnoticeable and so easy to use that it can be worn 24 hours a day! The inserts need to be removed before showering, swimming or participation in contact sports and in the gym. Cerezen™ costs only £675. It also comes with a lifetime warranty. We want to keep you as comfortable as possible, and our team will help you do just that. Please click here or call 020 7584 5551 to book your Cerezen appointment now.